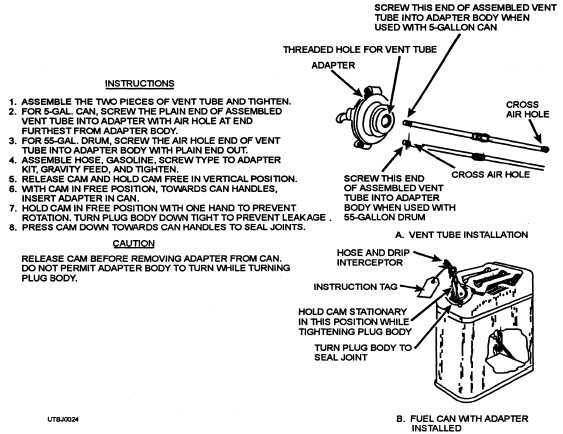 Figure 2-6.Fuel can adapter installation. 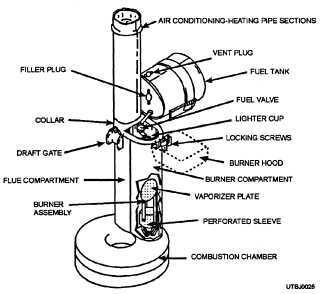 Home > Construction Training Manuals > Utilitiesman Volume 01 > Figure 2-6.Fuel Can Adapter Installation. Figure 2-6. - Fuel can adapter installation. Figure 2-7. - Corrugated can, fuel fired, immersion heater. compartment. Instructions for operation are located on the hinged hood that covers the top of the burner. 1. Place the immersion heater in a 32-gallon corrugated can and fill it until the water is 6 inches below the collar assembly of the heater. 2. Fill the fuel tank through the filler plug with unleaded or regular mogas and attach the fuel tank to the unit. 3. Assemble the four 2-foot sections of the flue and attach them to the unit. 1. Open the vent plug on the fuel tank and swing the lighter cup below the drip valve.